Aerial view of Hale Kai looking south. You will be steps away to Baby Beach! Another beautiful day in sunny Poipu! Sunsets at Hale Kai are those to remember! Aerial view looking north with Mount Haupu in the background. View of Baby Beach looking west. You are just steps away at Hale Kai! Large lanai area for your enjoyment. Your view from the lanai overlooking Baby Beach. View of Baby Beach and large yard area. Enjoy your meals overlooking Baby Beach! Either lounge or sit while you take in the amazing Ocean View. Large lanai area for you to unwind and enjoy your Poipu vacation! All homes under management with access to Baby Beach just steps away! 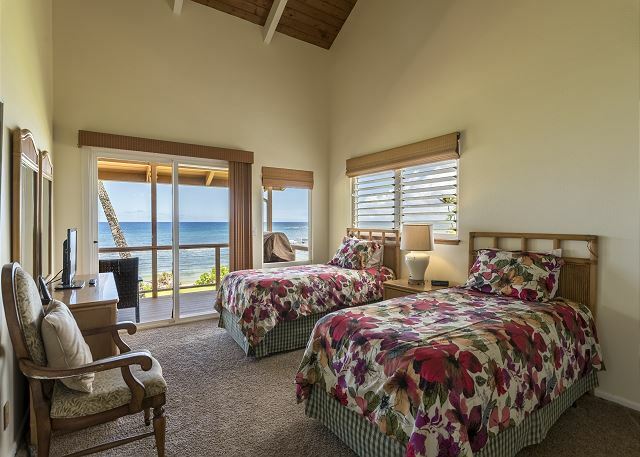 Hale Kai in Hawaiian means “ocean house” as there are spectacular views of the coastline and a white sand beach from every room. This home sleeps four with two bedrooms, two bathrooms and laundry facilities. It has a spacious kitchen and dining area and comes with cable T.V., DVD, stereo, dishwasher and microwave. King and 2 twin beds. Nice location with great view of ocean. Clean and well equipped. Only issue were ants which I believe could be remedied if they would use some ant traps.